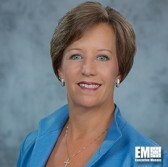 Rebecca Cowen-Hirsch, senior vice president for government strategy and policy at Inmarsat, said in an interview aired Monday on Federal News Radio that commercial satellite communications services play a critical role in military communications amid delays and other challenges facing military satcom programs. Cowen-Hirsch told Federal Tech Talk host John Gilroy that a commercial satcom service is designed to be interoperable with military satcom and cited how the company’s Global Xpress works to provide mobile data, video and voice communications services to users on the ground, sea or air while being interoperable with a military satellite communication service like the Wideband Global Satcom. “We think that this provides not only significant operational flexibility but from the security standpoint, it’s highly resilient… and most importantly it makes the mission successful to be able to have this highly capable system and interoperable with military satellite communication,” she added. She mentioned the commercial sector’s portfolio of satellites and related offerings in support of warfighters’ missions and the advantage of a global satcom service. “The fantastic aspect of a global satellite communications capability is the coverage and the capacity is available when and where needed,” she added.